Thankfully, the 21st century is getting more grown up by the minute. So why wouldn't any civilized society not want to treat men and women equally? And yet, one glance at world news and we know humanity still has some way to go before we can be considered truly enlightened. The words you choose to use can be incredibly beneficial to your aims - or swiftly damaging to outcomes. Sometimes, the power of a single word or phrase can be mind-boggling! In a legal sense of course, a single wrong word or lack of the correct wording, can make you considerably poorer. As a writer, video, audio or podcast presenter, website provider and communicator, your primary responsibility is to (a) really get to know your readers, listeners, visitors and customers, then (b) provide a balanced, entertaining delivery that matches (and exceeds) their expectations, (c) or which stimulates them to take some kind of action. For when you intuitively understand who your audience is, you'll ultimately succeed in addressing their needs and communicating in the kind of language that forms a two-way bond easily. 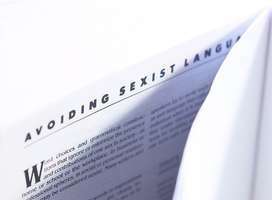 Avoid the use of sexist language if you want to win your readers over. Demonstrating consideration is not being servile or showing a "snowflake" mentality. You don't want to potentially alienate 50% of your reading audience do you? And we're just working out how to be nicer in one more way. If your audience is primarily men or mainly women, then perhaps you can relax what is being suggested throughout this article. However, most of us seek to connect with humanity and that involves at least two genders (more is fine too) and the application of a little extra consideration. Furthermore at long last, in many countries, job roles are much more mixed in today's working environment, so we shouldn't assume that a particular job role is designed for a specific gender. More often than not, gender is irrelevant anyway. Instead, skills and suitability are best maintained as the "driving force." That's why, one "wrong" word can be enough to subconsciously bias your reader "against" you as a deal presenter, writer, website owner, product or service provider. I'm not suggesting that you give special emphasis and consideration to your female audience - that in itself is unnecessary and can be viewed as offensive. Throughout history, women - the other, arguably more human portion of the human family - probably have only ever asked to be treated equally with consideration, kindness, respect, as we would with anyone irrespective of gender. Here is one writer who agrees with that simple ideal 100%. My view is that anything less total equality for both men and women and everyone in between, creates only a stunted, warped, unbalanced, more dangerous world - and even today, we have lots of examples that prove that point, repeatedly! The blindness of the Middle Ages is, thankfully, over. Though, even today, in our so-called modern, sophisticated world, enclaves of stupidity still exist. A world government will, I believe, in time address such issues. Over time, ignorance and bigotry always lose. As the global village touches ever more the last remnants of separation, there are fewer and fewer places for bad ideas to hide and thrive. If we want to go backwards, rampantly increase our levels of idiocy, and create a new generation of supremely twisted minds, perhaps the best way to do that is to create a society or organization where the rules or government or management are made only by men, or only by women. Both are equally wrong and misguided. In the same way that we need a man and a woman to create new human beings. We also need men, women, and yes, mixed genders too, to enlighten, teach, build, and nurture balanced minds for lifelong journeys. That's how we learn to understand, and therefore build a better, truly civilised world. Who knows, the next Einstein or curer of cancer may be a little girl just about surviving living in a mud hut in a third world country, yet whose life could be snuffed out in seconds as she is surrounded by a blanket of ignorance. The greatest news is that change happens whether we like it or not, giving hope for our little Einstein wherever he or she may be. The truth: women are special; men are special; mixed genders are special - children are the most special humans ever - I'm sure you get my point. Rant over :-) Let's get to the specifics. Key tip: my simple recommendation here is: always remember to exercise balance and consideration in your written and verbal communications. Balance respects gender, and a little respect goes a long way. So how can that be achieved easily? Answer: when faced with creating a sentence structure in which you might normally use "he" or "she", unless you have a concrete reason why not, rearrange the sentence slightly to use "they" or "their" instead. "An effective manager knows and understands his responsibilities and those of his staff." Why: it's simply wrong and inaccurate. What's more, job statistics have shown repeatedly that women often make superb managers (when we appreciate what many women either choose or are forced to take on a daily basis, we can see why). "An effective manager knows and understands their responsibilities and those of their staff." "Effective managers know and understand their responsibilities and those of their staff." For specific job roles, take care with your choice of words. Remedies here are simple: pause, and consult a thesaurus if necessary. "Police officers" instead of "policemen". "Sales associates" instead of "salesmen" or "saleswomen" (remember, gender is not relevant here). "The Chair", or simply "Chair" instead of "Chairman", or even the arguably more clumsy "Chair person" (overkill or simply trying too hard to be non-sexist). How we communicate says a lot about us and the organization we may represent. Often, an extra sales order, an additional sale, and so on, can be tantalizingly close and may be secured by paying close attention to such details. Moreover, in business, paying attention to "the small stuff" can make or break a deal. You may never even learn why you didn't get the sale, nevertheless, you won't want sexism in your communications to be the cause. Yet another example of how prevention really is better than cure. Therefore, if necessary, why not take the time and trouble to "upgrade" your communication skills before you need to attempt to repair a bad start?